We're big fans of the shake table, obviously, so here's another photo. 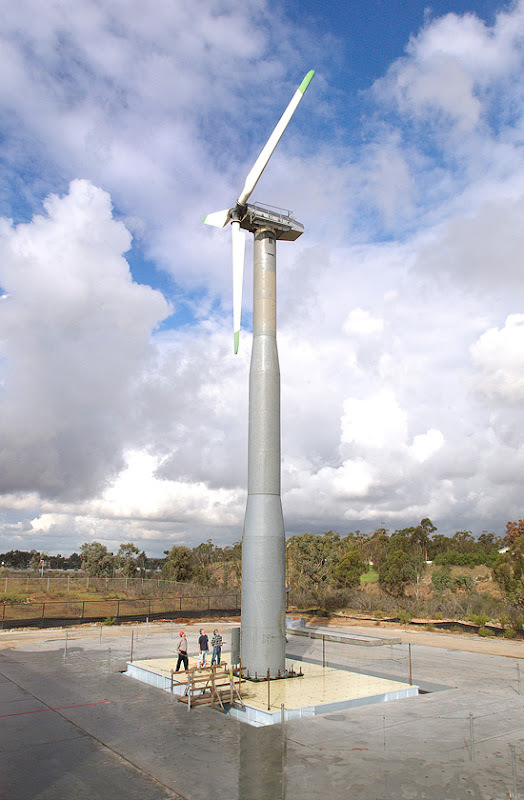 On top this time is a wind turbine ready to ride a simulated seismic wave. One wonders if this set-up isn't really for a science experiment but rather for an avant-garde staging of The Odyssey. It's Poseidon — the god of the sea, the enemy of Odysseus, the earth-shaker — as a hydrostatically pressurized steel platform against a mechanomorphosized Aeolus, the ruler of the winds. In Homer's tale, the hero managed to return to Ithaca with some help from Aeolus, but in this contemporary retelling on that tectonic proscenium, Poseidon may yet neutralize the winds and thwart the return of the king.